PART OF BERNYK ISLAND IN SPIDER BAY, A GORGEOUS POINT OF LAND, LANDSCAPED GROUNDS, PROTECTED BOAT DOCKAGE, 682 FEET OF SANDY COVE FOR SWIMMING. MAIN COTTAGE BUILT 1987 WITH 3 DETACHED SLEEPING CABINS WITH OWN BATHROOMS AND WATER, A CARETAKER`S CABIN. A SEPARATE DETACHED OWNER`S PRIVATE 2,500 SQ. FT. 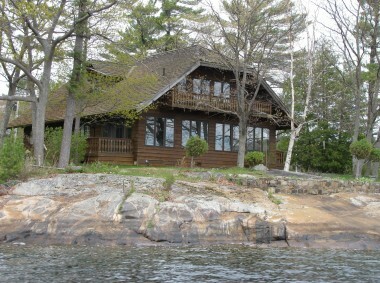 FULLY WINTERIZED CABIN, OFTEN REFERRED TO AS THE MAIN COTTAGE. THERE IS ALSO A SEPARATE COOKHOUSE WITH BUILT IN APPLIANCES AND A 35` x 50`QUONSET HUT FOR BOAT STORAGE. AN IDEAL LOCATION UP BY SANS SOUCI. For more information and or to buy this Spider Bay, Bernyk Island Waterfront Property, just north of Sans Souci please contact Rick Hill. View our Sans Souci Tour Area presentation.